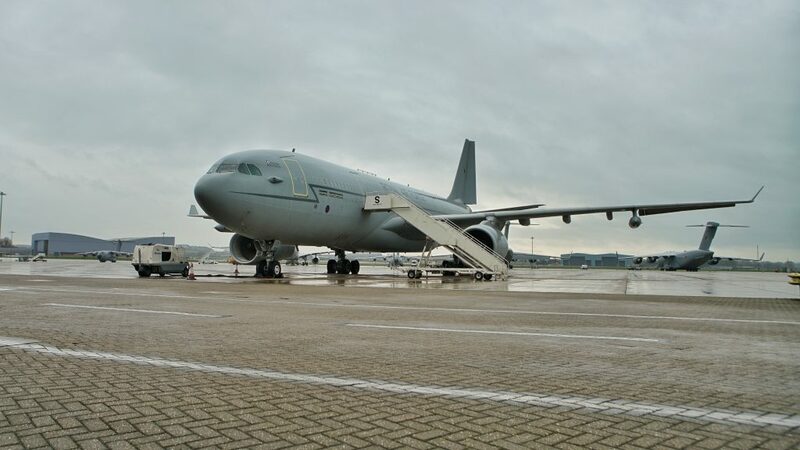 We were given the rare opportunity to fly in a Voyager A330 MRTT aircraft to witness RAF Eurofighter Typhoon and F35-B Lighting Jets refuelling over the Northern coast of Scotland during historic Joint Warrior military exercise. The exercise involved over 10,000 military personnel, 35 warships, 5 submarines, 59 aircraft and helicopters, from 13 NATO nations, as part of the 70th anniversary of NATO. The UK-led exercise was designed to test the collaborative operability of NATO’s joint forces in a series of joint air and sea missions, including rescue, aerial dogfight and tactical scenarios. We had to be up and out at 5am to check-in and board the flight at a special military airport in the North-West of England. We even needed to show our passports at check in, just to fly around the UK and return to the same airport. Boarding the A330 MRTT, it looks much like a regular aircraft inside, with seats and lavatories. They’re often used to transport forces and family members to bases abroad in places like Cyprus, The Falklands and Gibraltar. However, it’s the largest plane in the Royal Air Force, measuring almost 197 ft in length and has a wingspan of 60 metres. It can also carry an astonishing 111 tonnes of fuel, which is why it’s used to refuel other aircraft mid-air, extending their range and working capabilities. 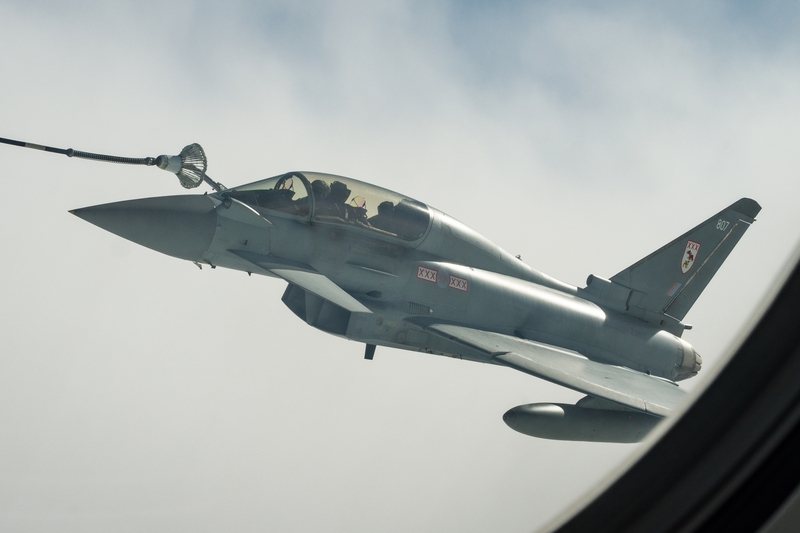 Before you see it, it’s hard to imagine how a jet like the Eurofighter Typhoon refuels in the air, it has a mind-blowing top flight speed of 1550mph. How can a jet refuel mid-air? 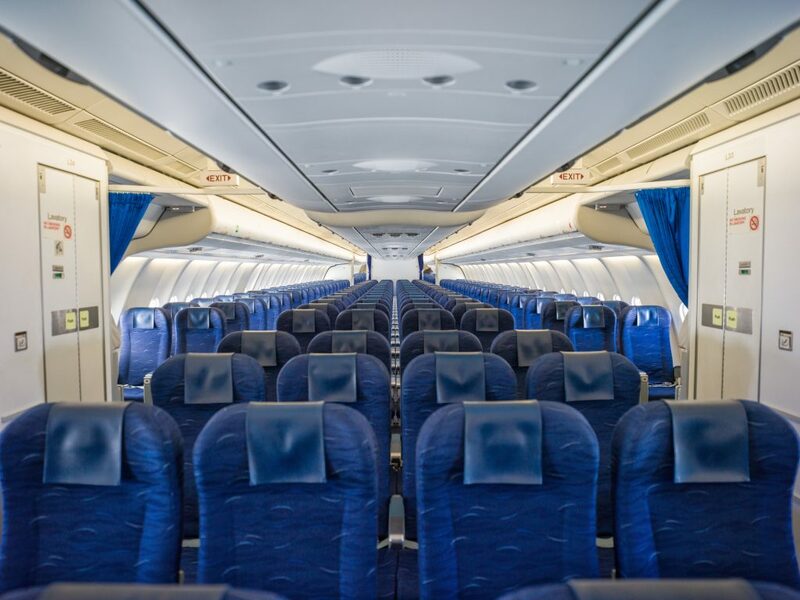 The Voyager flies at around 22,000-26,000 feet, lower than commercial flights, keeping them clear of commercial air traffic. Even though we knew what to expect, you can’t prepare yourself for seeing a jet pull up alongside your plane. What feels like a relatively ordinary flight (with a lot of free seats) changes drastically when the refuelling window opens. 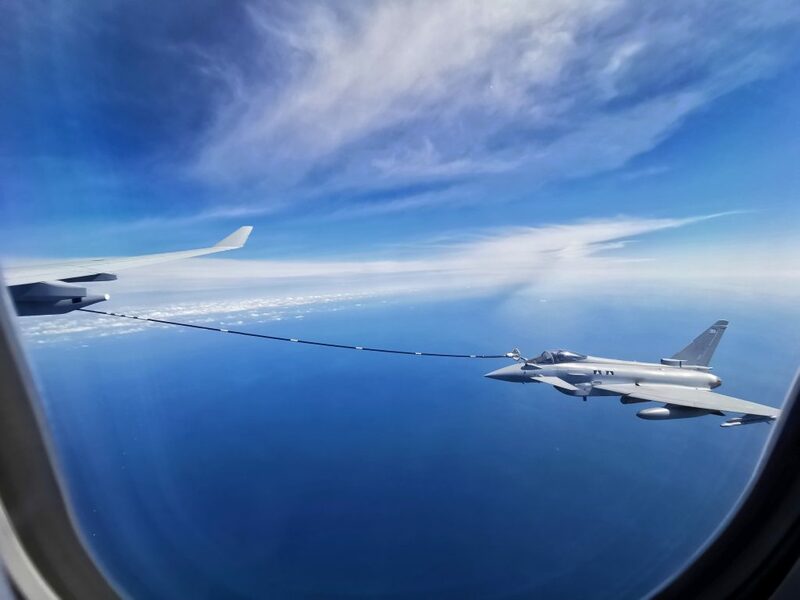 Using a technique developed in the 1940s and 1950s, air-to-air refuelling between NATO aircraft is typically carried out using a probe-and-drogue system. See below. This method sees a flexible hose line deployed from a hose drum unit (HDU) released from both wings of the Voyager, with a funnel-shaped basket (the drogue) on the end of it. This allows the fuel to be transferred from the tanker to the receiving aircraft. Once we saw the drogues deployed from the fuel pods, we knew it was time to look out for approaching jets. Although the pilot informed us that the jets were in the area, they don’t refuel on a schedule, they just announce themselves with a thundering roar that approaches the Voyager from behind. The jets initially arrive on the left side of the aircraft, letting the Voyager crew know they are ready to take on fuel. Then one jet drops down and reemerges on the right side. Then with all planes maintaining their speed, the pilots of each jet must deploy a retractable probe and steady their plane while lining the probe up with the drogue, all while flying at around 500mph. 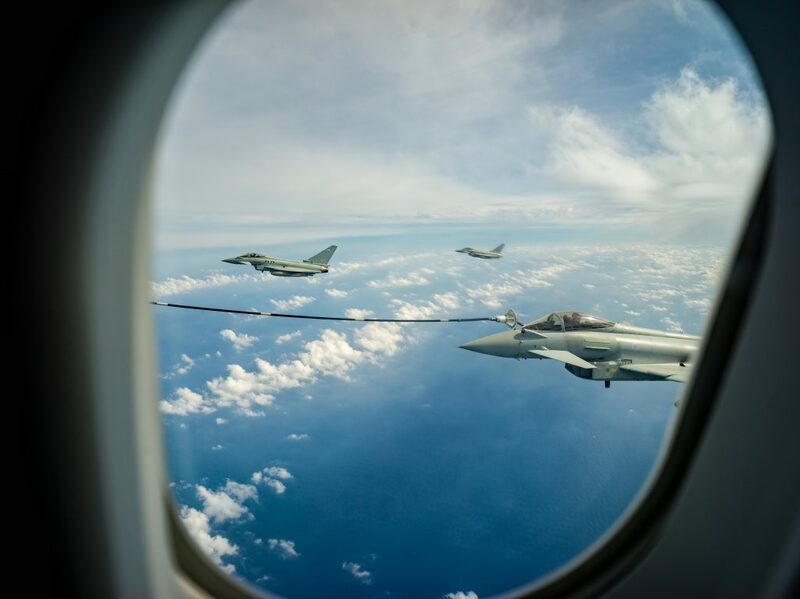 Once locked in, refuelling a jet takes anything from around 5-10 minutes. 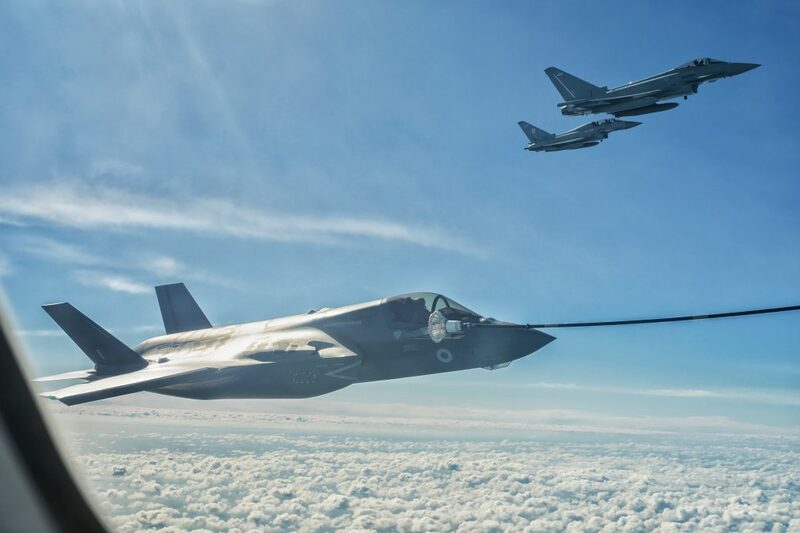 We were fortunate enough to see a total of 12 jets refuelled in the air, including a number of cutting-edge F35-B Lighting jets, one of the most advanced aircrafts on the planet. We spent 7 hours in total in the air above the UK during the exercise, with two refuelling windows. It was an incredible experience to have a glimpse of some of the operational capabilities of RAF aircraft during such a large exercise. We look forward to bringing you more military-tech focused content, if you have any questions, feel free to inbox us on social or comment below. Thanks for reading!